The morning of Sept. 11, 2001, there was more news than the country could bear and more than a TV screen could fit. Beyond the plane crashes and burning buildings, reports and rumors abounded of other attacks, explosions, evacuations. There was chaos, fear and both literal and figurative smoke clouding the situation. There was too much to process and too much to transmit; the news was on overload. Enter the ticker: the steady stream of headlines that glided along the bottom of the screen while anchors did interviews, while leaders addressed the public, while the towers fell. Fox News, which in so many ways set the tone, volume and attitude of cable news in the '00s, was first to deploy the ticker that morning, followed by CNN and MSNBC. It was an improvisational call  a simple, old-fashioned solution (harkening back to the "zipper" installed on the New York Times building in 1928) to a modern problem. The emergency receded, but the signifier of emergency never did. Crawls were used on TV before 9/11  but temporarily, for major breaking news, weather emergencies, elections, national crises. They asked for heightened alertness, gave your pulse reason to quicken just a little. And now, the data stream onscreen seemed to say, the emergency was permanent; the warning lights were always flashing. 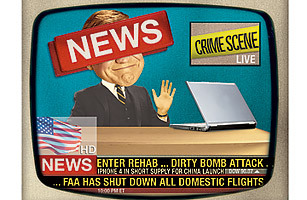 Like the multiple windows open on our computer screens, like the simultaneous pictures on an episode of 24  the other visual hallmark of the War on Terror years  the ticker said there was simply too much information to send through one channel alone. Big news day or slow news day, the urgency  alert alert alert  never stopped. To remove the ticker, after all, would be to say life had gone back to normal, to reject the national shibboleth that everything had changed. Who wanted to be the first to do that? (It would be months before news networks even began to gradually remove the American flags they had posted in their screen corners.) In more practical terms, a sense of crisis is good business for TV news. And producers found the ticker to be useful, a way to give viewers a sense that they were getting the most info in the least time and a place to shunt the headlines during the opinion shows that increasingly dominated cable post-9/11. But it always had to be filled: the ticker never sleeps. It opened up to sports scores and people news. It became a thing of accidental terror (dirty bomb attack ... might scroll on before a commercial that prevented it from finishing ... simulation exercise under way ...) or accidental bathos (rolling on under a news report about Israeli-Palestinian peace talks: iphone 4 in short supply for china launch ... Lindsay Lohan could enter rehab this week ...). Right after 9/11, in other words, the ticker was a way of offering raw news; in the years afterward, it became a symbol of the refusal to filter that news. Like a stuck car alarm, it stopped being an alert to any particular urgency and became a source of constant, low-level unease. And it was a microcosm of the hyperagitated news culture in general. The nine years that followed 9/11 were years of genuinely big headlines: Iraq, Katrina, Lehman Brothers. Yet it was sometimes hard to distinguish truly monumental events from ordinary news amplified by monumental technology. Every natural disaster, it seemed, was the worst ever, every potential pandemic the most deadly, every financial crisis the most dire, every terrorism alert the scariest, every political division the deepest and most acrimonious. Of course, just as you occasionally make a vow to turn off your ringer and stop taking text messages at dinner, the networks have tried lately to set up ticker-free zones. It now disappears during some news specials and opinion shows. In 2008, CNN substituted a more genteel "flipper," which turns over lazily like a line on an old arrivals-departures board. See the top 10 Jon Stewart moments. See the top 10 Stephen Colbert moments. Next Where Is Our Deliverance?